Green Labs is a committee that brings together students, staff, and faculty who are interested in green issues in a lab setting. This could be anyone currently working a lab building: lab managers, P.I.s, graduate students, building managers, or anyone else who has insight on what kinds of waste lab buildings produce, and what kinds of unique energy and water needs they have and what efficiencies could be explored. This committee also seeks interested EHS personnel, people from recycling, sustainability, energy management, and other departments as well as student groups interested in brainstorming ideas and solutions geared towards making UNC’s labs greener. The Green Labs committee has been a part of many exciting waste reduction, water reduction, and energy efficiency improvements in labs on campus, as well as campus-wide. We hope you will be a part of what this committee can become in the future! If you are interested in joining the committee, being added to the green labs listserv, or have ideas or suggestions for the committee please send an email to the chairs of the Green Labs committee, Hadley Hartwell and Catja van Heusden. Green Labs will be meeting quarterly in 2018. The next Green Labs meeting will be TBD. This excellent resource was created by a group of students in an environmental Capstone class, working for the Green Labs committee. 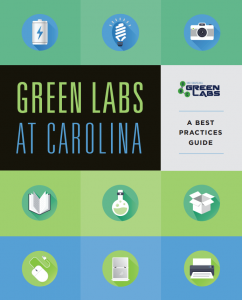 You may request a hard copy by emailing greenlabs@unc.edu or download a PDF by clicking on the picture to the left. NEW! Information about Fisher Scientific’s new reusable cooler and gel pack program! Friend and follow Green Games on Facebook! LEAP (lab equipment and assistance procurement) is a UNC listserv for sharing and swapping lab equipment and supplies. Send an email to join. Nitrile glove recycling: the undergraduate chemistry labs are recycling nitrile gloves through Kimberly-Clark. Please contact Nita Eskew for information. Information about the Renewable Energy Special Project Committee’s Efficient Freezer Rebate Program!